This bridge was my introduction to the Eli Whitney Museum and the whole surrounding area at the Hamden/New Haven border. 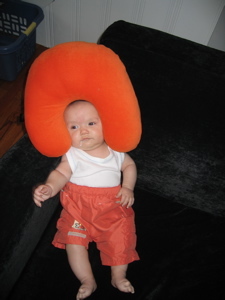 I brought my family to the museum wholly unaware of all the “stuff” around it. Lake Whitney, the Regional Water Authority stuff across the street, the Connecticut Trust for Historic Preservation, the museum building, the other buildings… and, of course, this bridge. Here – here’s what it looks like if you stand in the middle of it and spin around like a lunatic for some reason. 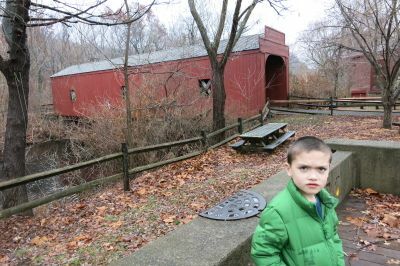 The current bridge is a 1980 replica of the original Ithiel Town bridge that was commissioned by Eli Whitney for his little industrial village back in the early 1800’s. In the spirit of what the Eli Whitney museum is all about (teaching kids invention and engineering and stuff), it appears that the architectural firm of Noyes Vogt solicited the assistance of area youths to rebuild the bridge according to Ithiel Town’s revolutionary truss design of 1820. In 1820, the architect Ithiel Town wrote to Eli Whitney requesting a written opinion of the model of a wooden bridge on which Town that year had filed a patent. Whitney’s reply, “its simplicity, lightness, strength, cheapness & durability, are in my opinion such as to render it highly worthy of attention,” recognized the admirable qualities of Town’s bridge, which was in fact a major design innovation. The lattice truss was an uninterrupted series of closely spaced diagonal timbers. The resulting web of overlapping triangles affected the distribution of stress to all members, so that the independent action of any one triangle was impossible. Ordinary pine or spruce planks were used for the diagonals and wooden connecting pins or tree-nails fastened the members at their points of intersection. This “garden trellis fence” concealed a truss design of considerable strength. 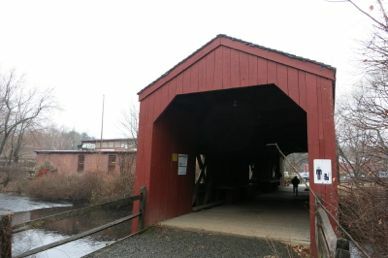 Not only was Town’s design strong and made of economical standard-dimension lumber, it was also easy to build: it did not require fancy mortises and tendons and could thus be erected by a common carpenter’s gang; it did not have to be custom-fitted to piers or abutments as arch bridges did. 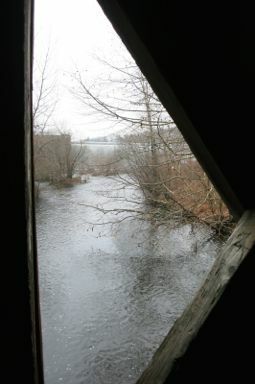 And the lightness of its timbers reduced the amount of labor that had formerly been needed to erect the pioneer bridges of Town’s predecessors, Timothy Palmer and Theodore Burr. Thus the lattice-truss bridge combined the features of strength and economy, which had great appeal, especially to those engaged in the expansion of the nation’s transportation network of highways and later, railroads. And there you go. 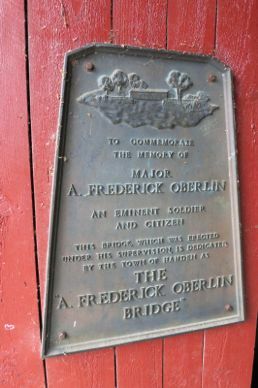 Except for the A. Frederick Oberlin part. It seems he was a really important Hamden guy – both in life and with his contributions to the historical society. Info is scant. My boys enjoyed running across the bridge and exploring some of the first bits of the trails on the other side of the Mill River. Little did they know that they were heading towards New Haven’s East Rock property and its miles of trails. The “view” of the “waterfall” (just a dam overflow) is pretty terrible here, but that’s not really the main attraction. As I write this I’m left wondering… was this bridge recently built just to build a covered bridge here? In other words, was there ever a covered bridge back in the day? My instincts say that no, there wasn’t. 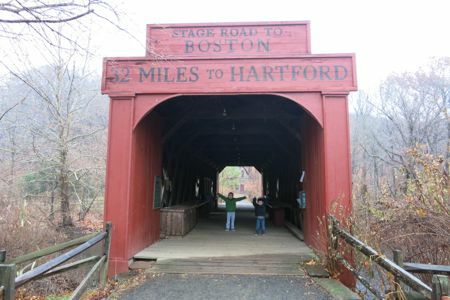 The current bridge, with its handsome stenciled mileage to Hartford and everything, was merely a museum “project” to display the genius of one of Whitney’s friends – and to allow the high school kids that take classes here to come to appreciate the engineering of early bridge design. Was this one of the bridges featured in the film Bridges of Madison County? There is a painting of the original bridge at the New Haven Museum. Google Ithiel Town’s Bridge Near East Rock by Durrie and you can see an image of it. Looks like the sides are solid, though. Tour Stop 4: Damian’s in Dutch Now!